This Universal Gun Cleaning Kit is the perfect gift for any hunter or shooting enthusiast! 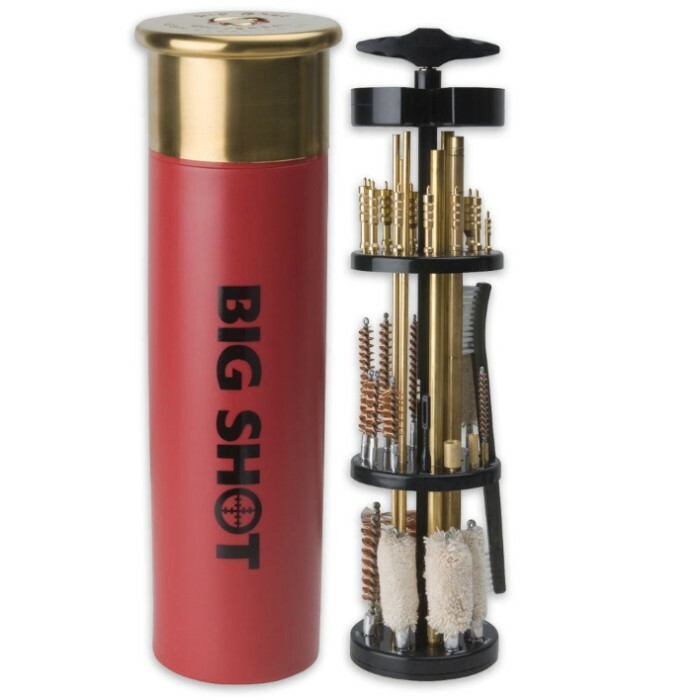 It cleans all major rifle, pistol and shotgun calibers from .17 caliber to 12 gauge shotgun. This 43-piece set includes brass wire brushes to fit calibers as small as .17 and as large as .30 caliber. It also includes 5 mops for shotguns and pistols and 55 3 in. x 3 in. cleaning pads. Solid brass cleaning rods to attach brushes and mops to are also included. The entire kit stores easily in the included polypropylene and stainless steel jumbo shotgun shell replica that will last for years. Well, Its Definitely Big, Has TONS Of Cleaning Tools, Everything Is Nice And Labeled Right On The shelves Where They Go, Cant Wait Till I Try It Out In Its First Cleaning.